NASA’s Project Morpheus is an interesting lander prototype. NASA hopes that, once complete, the machine will be able to transport space vehicles to the surface of the Moon. It is also a great testbed for trying out green propellant propulsion systems too, apparently. 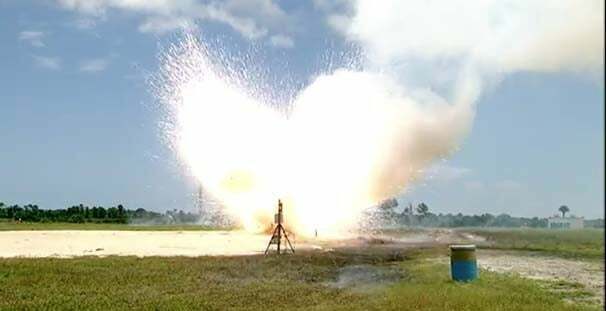 Unfortunately, the project suffered its first failure on August 9, though it created some rather spectacular explosions. The project's previous attempts at getting Morpheus in the air had been relatively successful--after all, a crane tethered it. Although it was tethered, it did give researchers an insight into how well the 1750-pound beast could hover using the specialized fuels, and how high it could fly. But as NASA tested the lander in its first free-flight test at Cape Canaveral, Morpheus rose up into the air on its own as expected, but that’s when things went wrong. The craft suffered a hardware component failure, which made it unable to maintain flight. The Morpheus Lander then took a nose-dive onto the ground, causing it to burst into flames and create a couple of large explosions. In some ways this is heartbreaking to watch--a robot that would help NASA safely transport vehicles to other planets in an eco-friendly manner is a fairly special build. However, NASA is taking the failure in its stride; it says that failures do happen and are expected, but that they also help engineers further develop spacecraft. NASA’s engineers are looking into the failure and will post the data on NASA’s website at a later date. You can follow the project’s progress on its website.